“Stress” has become a bit of buzzword, wouldn’t you agree? It seems that wherever you go and whoever you speak to, everybody’s got some form of stress in their lives. Our constant exposure to stress has really taken the spotlight as a modern-day health issue. As it turns out, chronic levels of stress are pretty bad for our health! Today, instead of dwelling on the side-effects of stress, let’s focus on the positive! Find out some of the tremendous health benefits of relaxation and easy ways you can tap into calm anytime, anywhere. Aside from obviously feeling less stressed, relaxation offers whole-body benefits to your physical health, as well! While the ‘fight or flight’ response can cause inflammation and disease, the ‘relaxation response’ can benefit numerous physiological systems. Relaxation can help to reduce your blood pressure and heart rate, which has positive side-effects upon your long-term cardiovascular health. 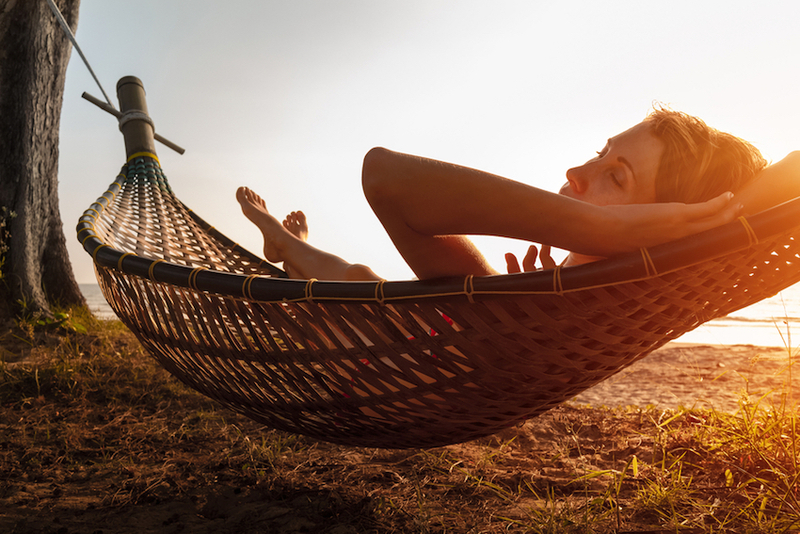 Relaxation can also slow aging, lower inflammation, prevent skin breakouts, improve libido and produce “feel-good” chemicals in the brain, among other benefits! So, now we know that relaxation does wonders for your health. But short of quitting modern life and becoming a full-time yoga, how can you become more relaxed? Unless we create dedicated, non-negotiable periods of calm in our day, time-out will be crowded out by the never-ending “to-do” lists and demands on our day. Yet creating, this time, doesn’t need to be one more stressful thing to schedule into your day. It can fit around other easy, daily activities that you already do. It’s just about doing things a teeny bit differently, and with greater mindfulness. Take a coffee or tea break without distractions. Put down your phone. Close down your emails. Enjoy ten minutes to sip your brew and reflect on your thoughts peacefully. Take an extra 30 seconds in the shower to do a body brush or natural body scrub. It’s amazing how little steps of self-care can dial up your sense of calm and self-love. Starting to feel hunched up and tense at work? Give yourself a ten-second mini-massage around your neck and shoulders. Buy an acupuncture foot roller. Most of us spend some portion of our days seated. You can continue any desk work or couch time and roll your feet over these simple little contraptions simultaneously. It’s like getting an invigorating foot massage! Play nature sounds or relaxing music. Much of our time is spent around stimulating noise such as traffic, children crying, television or upbeat music. A quick and easy way to ground yourself is to immerse yourself in calming, soothing noise. Some noise-cancelling headphones will drown out the rest if you don’t have a quiet space to do this. How we start the morning can truly set the mood for the rest of your day to follow. While life is always going to throw the odd curve balls regardless of how well prepared we are, your day is far more likely to feel calm if you can start it in a peaceful, organized state of mind. Simple steps like laying out tomorrow’s outfit, packing lunches or even writing out a brief to-do list can really reduce the stress of morning deadlines. Try it out for yourself tonight and feel the difference tomorrow! I won’t reiterate the benefits of meditation in this article. The health improvements of meditation are widely discussed and you can also brush up on the research here and here. The bottom line is that most serene, successful people practice meditation on a regular basis. An easy way to get started is to set your alarm clock ten minutes earlier than usual and make it your first priority for the day. This immediately puts your body and mind into ‘calm setting’. It might truly be the most important ten minutes you spend all day. Ever have those days when you just wake up on the wrong side of the bed and feel pretty lousy? Sometimes, it’s hard to snap ourselves out of it. You might be telling yourself to calm down or not stress out too much, yet nothing seems to work. At times like these, it can be helpful to call on a little external inspiration. Listening to somebody else – rather than our own internal dialogue – can help to refocus your mind and make you feel grounded again. Choose something that is inspiring, uplifting and altogether positive. You’ll be smiling again before you know it! Returning to your breath is one of the fastest ways to access calm. This is particularly effective if breathwork is a part of your meditation or yoga practice. Simply breath in for a count of four, focusing on filling your belly with oxygen. Hold for four counts, then expel your breath for a count of eight. It’s almost impossible to not feel relaxed after breathing this way! If you can find a spot of sunshine and fresh air, I find this technique particularly calming to perform outdoors. 6. Have a Belly Laugh! The old adage, ‘laughter is the best medicine’ certainly, has a ring of truth to it. A good chuckle releases feel-good hormones, improves immunity and releases tension. Humor is a personal thing, so choose a form that fits you best! Many comedians podcast or stream their shows online, so you might want to unwind on the weekend with a good comedy film or watch some funny YouTube clips… whatever lights up your soul and gets you giggling! Too often, when we feel stressed, it is hard to remember that this feeling won’t last forever. Beyond a stressful day, month or a certain set of circumstances, your sun will shine again. Life naturally ebbs and flows, and when we’re in a normal ‘down’ phase it’s hard to keep a clear perspective that things almost always look up again. When you’re feeling down about how things are at the present, take a few moments to write out some goals that inspire you and move you towards a more expansive place. This can help you to remember that we can take baby steps today to move us towards happier times. It’s amazing how helping others actually uplifts our spirits, as well. Next time you’re feeling stressed out and stuck in ‘me’ problems, ask yourself if there is some small way you can be of service to someone else? Shifting the focus from ourselves to other people feels so good. It also gives us a sense of purpose and value in the world. I know, I know… You’ve heard this one before. But that’s because it’s TRUE! Affirmations work. They can powerfully improve our mood and sense our self-efficacy – both of which improve our overall relaxation. And if you know that you’re in for a stressful or busy day, choose a powerful affirmation to come back to when you feel yourself getting strung out. Phrase it in the present, active tense, such as ‘Right now I choose to be pure, calm grace’. 10. Put The First Nine Tips Into Practice! It’s all well and good to read about these self-development practices and to understand on a mental level how they can be of benefit to you. However, words and knowledge don’t really change our lives unless we integrate them into our daily lives as well! Remember that you don’t have to do everything at once. But you do have to start somewhere – even if it’s a small, simple, baby step. You’re still moving in a more positive direction! Stress has become the normal state of being for many of us. Hopefully, this article has put more of a positive spin on how we can focus on the flip side. That is, being more relaxed, happy and peaceful people. Here’s to making “relaxation” a more common word in our daily thoughts and vocabulary! Relaxation benefits your heart, aging, and brain. Relaxation needs to be practiced regularly before it becomes a habit and we can reap the benefits. Small, regular acts of calm make a huge difference! Having an organized morning routine, as well as meditation, deep breathing, laughing, listening to uplifting podcasts and creating daily rituals of calm can make you feel more relaxed. Are There Any Other Tips You’d Like To Add Toward This Goal? Let Us Know In The Comments Section Below! This article is shared with permission from our friends at foodmatters.com.